In September 2011, Sepsis Alliance announced the first ever Sepsis Awareness Month. Choosing a month to mark a medical condition isn’t as easy as it may seem. Some organizations see a natural fit. Many women’s issues are connected with May, to coincide with Mother’s Day, and heart disease goes well with February in conjunction with Valentine’s Day. But how does an organization find a month that has no such fit? Some months are packed with health observances. September seems to be the most popular, according to Healthfinder.gov, with organizations marking 21 awareness months, 2 awareness weeks, and 11 awareness days. April and May follow pretty closely in popularity. Other months, like December and January, are quiet. Given the busy-ness of the holidays and end-of-year events, it’s understandable that awareness events might be quieter, so as not to get lost in the crowd. It’s a balance. Do you choose the busy times or the quiet times? At Sepsis Alliance, we were working hard to raise sepsis awareness all year round. But we also realized that having a month dedicated to increasing our efforts and rallying the support of others would help raise the profile of this little known yet often deadly condition. As we looked around for a good fit, we realized it was as simple as SEP – for SEPsis and SEPtember. Sepsis Awareness Month was born. The next year brought about two additions to Sepsis Awareness Month. The Global Sepsis Alliance (Sepsis Alliance is a founding member of GSA) declared September 13 as World Sepsis Day, and Sepsis Alliance held the inaugural Sepsis Heroes gala. The gala was made possible after we were approached by the late Scott Alling, who wanted to become involved in raising sepsis awareness. Because of Scott’s generosity, the Sepsis Heroes gala has now become a popular annual event that raises both sepsis awareness and funds that go directly towards sepsis education for the public and healthcare professionals. It didn’t take long for Sepsis Awareness Month to take off, and within just a few years, we were fielding requests for information and ideas from hundreds of organizations and individuals not only from the United States and Canada, but other countries as well. Many sepsis advocates pushed for government recognition of Sepsis Awareness Month and several states and cities in the U.S. have formally recognized either Sepsis Awareness Month or World Sepsis Day. You can share your story with friends, family, and community, and our Faces of Sepsis section. You can use our awareness activities, which include the Sepsis Awareness Superhero Challenge, the It’s About TIME toolkit, and a healthcare toolkit. You can speak up and say the word: sepsis. The Sepsis Awareness Superhero Challenge takes place this year on Saturday, September 29. Supporters are challenged to move an extra mile for awareness. The activity is up to each team or supporter – it could be cycling, hiking, walking, swimming, dancing – anything that makes you move. 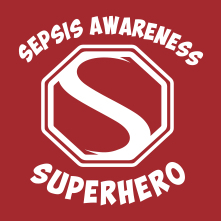 When you pledge your support, you receive a Sepsis Superhero sticker so you can let the world know that you are joining the fight against sepsis. You can even join the Facebook event to connect with other superheroes in your area. And on September 29, wear your sticker and do your challenge. You can post your photos online using #SepsisSuperhero and your activity may be featured in Sepsis Alliance social media. If you raise $50 or more for your event, you can receive your own Sepsis Awareness Superhero cape to wear on September 29. It’s About TIME is our newest initiative, to help simplify the recognition of sepsis symptoms. Here you will find an infographic that you can use to help others learn about the most common sepsis symptoms, as well as a detailed white paper written to help people understand why time is so important in recognizing and fighting sepsis. 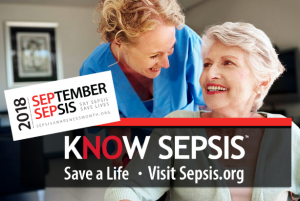 Finally, our Sepsis Awareness Month Toolkit provides volunteers with infographics and posters, website banners, social media messages and flyers, fundraising information, public service announcements, and much, much more. It’s also never too late to start thinking about Sepsis Awareness Month 2019 or awareness events all year long. Think about how you like to learn about important issues, what makes you sit up and take notice? Check out the Sepsis Alliance National Billboard Campaign. Do you learn better by attending talks or workshops. We can provide you with a Sepsis 911 Toolkit so you can host a presentation on sepsis to help educate others. You can hold an awareness event and you can even find out how to approach your lawmakers to add your state or city to those that officially recognize Sepsis Awareness Month or World Sepsis Day.